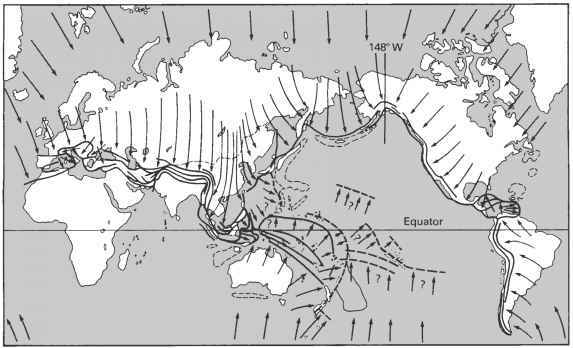 Although the theory of the new global tectonics, or plate tectonics, has largely been developed since 1967, the history of ideas concerning a mobilist view of the Earth extends back considerably longer (Rupke, 1970; Hallam, 1973a; Vine, 1977; Frankel, 1988). Ever since the coastlines of the continents around the Atlantic Ocean were first charted, people have been intrigued by the similarity of the coastlines of the Americas and of Europe and Africa. Possibly the first to note the similarity and suggest an ancient separation was Abraham Ortelius in 1596 (Romm, 1994). In 1620, Francis Bacon, in his Novum Organum, commented on the similar form of the west coasts of Africa and South America: that is, the Atlantic coast of Africa and the Pacific coast of South America. He also noted the similar configurations of the New and Old World, "both of which are broad and extended towards the north, narrow and pointed towards the south." Perhaps because of these observations, for there appear to be no others, Bacon is often erroneously credited with having been first to notice the similarity or "fit" of the Atlantic coastlines of South America and Africa and even with having suggested that they were once together and had drifted apart. In 1668, François Placet, a French prior, related the separation of the Americas to the Flood of Noah. Noting from the Bible that prior to the flood the Earth was one and undivided, he postulated that the Americas were formed by the conjunction of floating islands or separated from Europe and Africa by the destruction of an intervening landmass, "Atlantis." One must remember, of course, that during the 17th and 18th centuries geology, like most sciences, was carried out by clerics and theologians who felt that their observations, such as the occurrence of marine fossils and water-lain sediments on high land, were explicable in terms of the Flood and other biblical catastrophes. Figure 1.1 Snider's reconstruction of the continents (Snider, 1858). Alexander von Humbolt noted the geometric and geologic similarities of the opposing shores of the Atlantic, but he too speculated that the Atlantic was formed by a catastrophic event, this time "a flow of eddying waters . . . directed first towards the north-east, then towards the north-west, and back again to the north-east . . . What we call the Atlantic Ocean is nothing else than a valley scooped out by the sea." In 1858 an American, Antonio Snider, made the same observations but postulated "drift" and related it to "multiple catastrophism" - the Flood being the last major catastrophe. Thus Snider suggested drift sensu stricto, and he even went so far as to suggest a pre-drift reconstruction (Fig. 1.1). Figure 1.2 Taylor's mechanism for the formation of Cenozoic mountain belts by continental drift (after Taylor, 1910). thought, the proponents of continental drift still resorted to catastrophic events to explain the separation of the continents. Thus, George Darwin in 1879 and Oswald Fisher in 1882 associated drift with the origin of the Moon out of the Pacific. This idea persisted well into the 20 th century, and probably accounts in part for the reluctance of most Earth scientists to consider the concept of continental drift seriously during the first half of the 20th century (Rupke, 1970). A uniformitarian concept of drift was first suggested by F.B. Taylor, an American physicist, in 1910, and Alfred Wegener, a German meteorologist, in 1912. For the first time it was considered that drift is taking place today and has taken place at least throughout the past 100-200 Ma of Earth history. In this way drift was invoked to account for the geometric and geologic similarities of the trailing edges of the continents around the Atlantic and Indian oceans and the formation of the young fold mountain systems at their leading edges. Taylor, in particular, invoked drift to explain the distribution of the young fold mountain belts and "the origin of the Earth's plan" (Taylor, 1910) (Fig. 1.2 and Plate 1.1 between pp. 244 and 245). 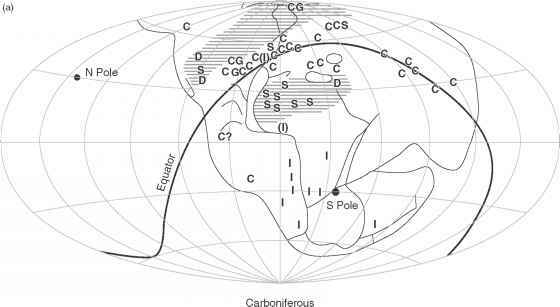 Figure 1.3 Wegener's reconstruction of the continents (Pangea), with paleoclimatic indicators, and paleopoles and equator for (a) Carboniferous and (b) Permian time. I, ice; C, coal; S, salt; G, gypsum; D, desert sandstone; hatched areas, arid zones (modified from Wegener, 1929, reproduced from Hallam, 1973a, p. 19, by permission of Oxford University Press). Toit's idea of it being made up of two supercontinents (du Toit, 1937) (Fig. 11.27). The more northerly of these is termed Laurasia (from a combination of Laurentia, a region of Canada, and Asia), and consisted of North America, Greenland, Europe, and Asia. The southerly supercontinent is termed Gondwana (literally "land of the Gonds" after an ancient tribe of northern India), and consisted of South America, Antarctica, Africa, Madagascar, India, and Australasia. Separating the two supercontinents to the east was a former "Mediterranean" sea termed the paleo-Tethys Ocean (after the Greek goddess of the sea), while surrounding Pangea was the proto-Pacific Ocean or Panthalassa (literally "all-ocean"). Wegener propounded his new thesis in a book Die Entstehung der Kontinente and Ozeane (The Origin of Continents and Oceans), of which four editions appeared in the period 1915-29. Much of the ensuing academic discussion was based on the English translation of the 1922 edition which appeared in 1924, consideration of the earlier work having been delayed by World War I. Many Earth scientists of this time found his new ideas difficult to encompass, as acceptance of his work necessitated a rejection of the existing scientific orthodoxy, which was based on a static Earth model. Wegener based his theory on data drawn from several different disciplines, in many of which he was not an expert. The majority of Earth scientists found fault in detail and so tended to reject his work in toto. Perhaps Wegener did himself a disservice in the eclecticism of his approach. Several of his arguments were incorrect: for example, his estimate of the rate of drift between Europe and Greenland using geodetic techniques was in error by an order of magnitude. Most important, from the point of view of his critics, was the lack of a reasonable mechanism for continental movements. 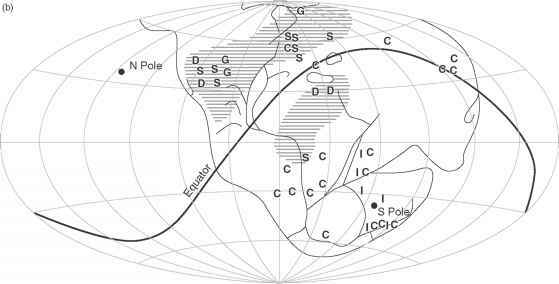 Wegener had suggested that continental drift occurred in response to the centripetal force experienced by the high-standing continents because of the Earth's rotation. Simple calculations showed the forces exerted by this mechanism to be much too small. Although in the later editions of his book this approach was dropped, the objections of the majority of the scientific community had become established. Du Toit, however, recognized the good geologic arguments for the joining of the southern continents and A. Holmes, in the period 1927-29, developed a new theory of the mechanism of continental movement (Holmes, 1928). He proposed that continents were moved by convection currents powered by the heat of radioactive decay (Fig. 1.4). Although differing consider ably from the present concepts of convection and ocean floor creation, Holmes laid the foundation from which modern ideas developed. Between the World Wars two schools of thought developed - the drifters and the nondrifters, the latter far outnumbering the former. Each ridiculed the other's ideas. The nondrifters emphasized the lack of a plausible mechanism, as we have already noted, both convection and Earth expansion being considered unlikely. The nondrifters had difficulty in explaining the present separation of faunal provinces, for example, which could be much more readily explained if the continents were formerly together, and their attempts to explain these apparent faunal links or migrations also came in for some ridicule. They had to invoke various improbable means such as island stepping-stones, isthmian links, or rafting. It is interesting to note that at this time many southern hemisphere geologists, such as du Toit, Lester King, and S.W. Carey, were advocates of drift, perhaps because the geologic record from the southern continents and India favors their assembly into a single supercontinent (Gondwana) prior to 200 Ma ago. Very little was written about continental drift between the initial criticisms of Wegener's book and about 1960. In the 1950s, employing methodology suggested by P.M.S. Blackett, the paleomagnetic method was developed (Section 3.6), and S.K. Runcorn and his co-workers demonstrated that relative movements had occurred between North America and Europe. The work was extended by K.M. Creer into South America and by E. Irving into Australia. Paleomagnetic results became more widely accepted when the technique of magnetic cleaning was developed in which primary magnetization could be isolated. Coupled with dating by faunal or newly developed radiometric methods, the paleomagnetic data for Mesozoic to Recent times showed that there had been significant differences, beyond the scope of error, in the motions between various continents. Figure 1.4 The concept of convection as suggested by Holmes (1928), when it was believed that the oceanic crust was a thick continuation of the continental "basaltic layer'. (a) Currents ascending at A spread laterally, place a continent under tension and split it, providing the obstruction of the old ocean floor can be overcome. This is accomplished by the formation of eclogite at B and C, where sub-continental currents meet sub-oceanic currents and turn downwards. The high density of the eclogite causes it to sink and make room for the continents to advance. (b) The foundering of eclogite at B and C contributes to the main convective circulation. The eclogite melts at depth to form basaltic magma, which rises in ascending currents at A, heals the gaps in the disrupted continent and forms new ocean floor. Local swells, such as Iceland, would be formed from old sial left behind. Smaller current systems, initiated by the buoyancy of the basaltic magma, ascend beneath the continents and feed flood basalts or, beneath "old"(Pacific) ocean floor, feed the outpourings responsible for volcanic islands and seamounts (redrawn from Holmes, 1928). sedimentation. But as J. Tuzo Wilson, a Canadian geo-physicist, said, this is like looking at the deck of a ship to see if it is moving. If there is a possibility that the continental areas have been rifted and drifted apart and together, then presumably there should be some record of this within the ocean basins. However, it is only since World War II and notably since 1960 that sufficient data have been obtained from the 60% of the Earth's surface covered by deep water for an understanding of the origin and history of the ocean basins to have emerged. It transpires that, in contrast to the continents, the oceanic areas are very young geologically (probably no greater than 200 Ma in age) and that horizontal, or lateral, movements have been all-important during their history of formation. 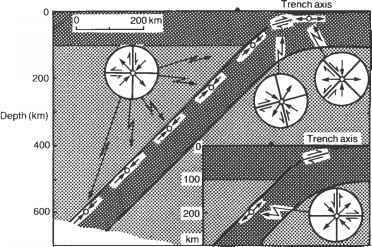 Figure 1.5 The concept of sea floor spreading (after Hess, 1962). volcanic submarine swell or rise which occupies a median position in many of the world's oceans (Fig. 1.5). Oceanic crust is much thinner than continental crust, having a mean thickness of about 7 km, compared with the average continental thickness of about 40 km; is chemically different; and is structurally far less complex. The lateral motion of the oceanic crust was believed to be driven by convection currents in the upper mantle in the fashion of a conveyer belt. In order to keep the surface area of the Earth constant, it was further proposed that the oceanic crust is thrust back down into the mantle and resorbed at oceanic trenches. These are vast bathymetric depressions, situated at certain ocean margins and associated with intense volcanic and earthquake activity. Within this framework the continents are quite passive elements - rafts of less dense material which are drifted apart and together by ephemeral ocean floors. The continents themselves are a scum of generally much older material that was derived or separated from the Earth's interior either at a very early stage in its history or, at least in part, steadily throughout geologic time. Instead of blocks of crust, we now think in terms of "plates" of comparatively rigid upper mantle and crust, perhaps 50-100 km thick and which we term lithosphere (a term originally coined by R.A. Daly many years ago and meaning "rock layer"). Lithospheric plates can have both continental and oceanic crust embedded in them. The theory of sea floor spreading was confirmed in the period 1963-66 following the suggestion of F.J. Vine and D.H. Matthews that the magnetic lineations of the sea floor might be explained in terms of sea floor spreading and reversals of the Earth's magnetic field (Section 4.1). On this model the conveyor belt of oceanic crust is viewed as a tape recorder which registers the history of reversals of the Earth's magnetic field. A further precursor to the development of the theory of plate tectonics came with the recognition, by J.T. Wilson in 1965, of a new class of faults termed transform faults, which connect linear belts of tectonic activity (Section 4.2). The Earth was then viewed as a mosaic of six major and several smaller plates in relative motion. The theory was put on a stringent geometric basis by the work of D.P. McKenzie, R.L. Parker, and W.J. Morgan in the period 1967-68 (Chapter 5), and confirmed by earthquake seismology through the work of B. Isacks, J. Oliver, and L.R. Sykes. The theory has been considerably amplified by intensive studies of the geologic and geophysical processes affecting plate margins. Probably the aspect about which there is currently the most contention is the nature of the mechanism that causes plate motions (Chapter 12). Although the basic theory of plate tectonics is well established, understanding is by no means complete. Investigating the implications of plate tectonics will fully occupy Earth scientists for many decades to come.